Naresh K. Malhotra is Senior Fellow, Georgia Tech CIBER and Regents' Professor Emeritus, College of Management, Georgia Institute of Technology, USA. He received the prestigious Academy of Marketing Science CUTCO/Vector Distinguished Marketing Educator Award in 2005. 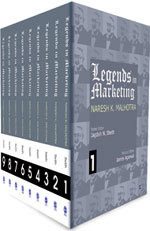 In 2010, he was selected as a "Legend in Marketing" based on his lifetime contributions to the marketing discipline. In 2011, he received the "Best Professor in Marketing Management" Award, conferred by Asia's Best B-School Awards. He was Chairman, Academy of Marketing Science Foundation, 1996-98; President, Academy of Marketing Science, 1994-96; and Chairman, Board of Governors, 1990-92. He is a Distinguished Fellow of the Academy and Fellow, Decision Sciences Institute. He is the Founding Editor of Review of Marketing Research, and served as an Associate Editor of Decision Sciences for 18 years. He has also served as Section Editor, Health Care Marketing Abstracts, Journal of Health Care Marketing. In addition, he serves on the editorial board of several journals. His book entitled Marketing Research: An Applied Orientation, sixth edition, published in 2010, has been translated into Chinese, Spanish, Russian, Portuguese, Hungarian, French, Bahasa Indonesia, and Japanese. His book, Basic Marketing Research: Integration of Social Media, fourth edition, has also received critical acclaim. His latest book, Essentials of Marketing Research: A Hands-On Orientation, was published by Pearson in 2014. He has published more than 135 papers in major refereed journals, including the Journal of Marketing Research, Journal of Consumer Research, Marketing Science, Management Science, Journal of Marketing, Journal of Academy of Marketing Science, Journal of Retailing, Journal of Health Care Marketing, and leading journals in Statistics, Management Science, Information Systems, and Psychology. Dr Malhotra has consulted for business, nonprofit, and government organizations in the USA and many other countries, and has served as an expert witness in legal and regulatory proceedings. He is a winner of numerous awards and honors for research, teaching, and service to the profession, including the Outstanding Marketing Teaching Excellence Award, 2003, from the Academy of Marketing Science. He has several top research rankings based on his journal publications.